From basic to advanced, JCCC offers courses through the American Heart Association (AHA) that will keep your lifesaving certifications up to date. AHA instructors deliver hands-on learning using modern equipment in a relaxed, professional environment. Demonstrations, classroom participation and testing are all integral parts of this progressive program. Designed for healthcare providers, this American Heart Association-aligned program combines classroom and hands-on activities covering the cardiovascular and respiratory systems, as well as insight into the emergency medical services system. You will learn and demonstrate current, practical CPR skills for adults, children and infants, as well as the use of automated external defibrillators (AEDs). Advanced Cardiac Life Support (ACLS) is a series of medical procedures for the urgent treatment of issues including cardiac arrest, stroke and other emergencies. 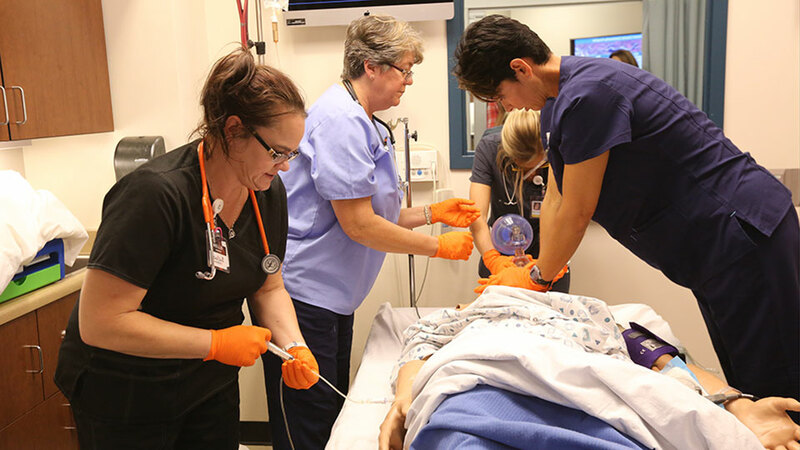 JCCC’s program combines both classroom and hands-on activities, and successfully passing the ACLS written exam and skills test results in an ACLS Provider Course Completion Card. Students in the Advanced Cardiac Life Support (ACLS) Update course must already be certified as ACLS providers. JCCC’s Update course provides the knowledge and skills needed to evaluate and manage adults experiencing cardiac dysrhythmias and cardiac arrest.